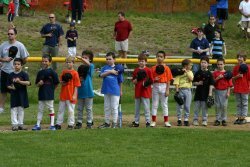 On May 22, 2010, ABYB Minor A and Minor B divisions held the second annual Interleague All-Star Day at Veterans Field. The weather was great and the baseball events were even better. 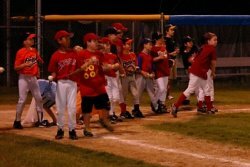 Before the big day, the Minor A and Minor B coordinators divided up the players on American League and National League teams to play another mixed team within their same ABYB division. Games started each hour from 8:00 AM to 7:00 PM, with 7 Minor A games and 5 Minor B games. 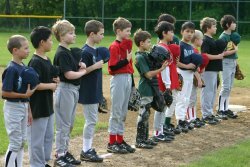 Every game started with an announcer introducing players, followed by the Star Spangled Banner, and those famous two words: "Play Ball!" The games were full of action, great plays, and smiling faces. 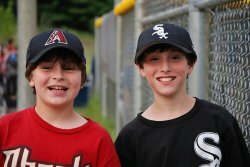 At the conclusion of every game, players and siblings raced to purchase a "Chuck-a-Ball," one part of the fundraiser to support the Jimmy Fund. The players threw these balls towards a target in center field or finessed the ball closest to the pitching rubber. Want to see a Chuck-a-Ball video? Click here. While the closest balls to the targets won special prizes donated by local businesses, generous families, and various sports teams, additional prizes were given to some other lucky ball chuckers. Participants in Chuck-a-Ball each received an ABYB Interleague Day sticker (designed and donated by the Karess family) and a gift card from the Acton Bowladrome (generously donated by the Acton Bowladrome). Throughout the day, Chuck-a-Ball proceeds were collected for a donation to the Jimmy Fund. Additionally, some great prizes were raffled off. The raffle drawings were conducted at the end of the night, with 25 players screaming with excitement as each prize was drawn. Overall, ABYB's Interleague Day raised $2,417 for the Jimmy Fund! Everyone walked away a true All Star. Tim Wakefield autographed ball Tim Wakefield and the Geraneo family Josh A.
Josh Beckett autographed ball Josh Beckett and the Coppolino family Dylan R.
Kevin Youkilis autographed ball Kevin Youkilis and the Coppolino family Scott G.
Lars Anderson autographed ball McOsker family and the Portland Sea Dogs Pratheek H.
Clay Buchholz autographed ball McOsker family and the Portland Sea Dogs Mike F.
2 Tickets to a Pawtucket Red Sox game Anonymous Donor (Minor A family) Jamieson D.
2 Tickets to a Boston Red Sox game Karess family Jake M.
After Interleague Day, players were encouraged to write a few paragraphs or draw a picture about their Interleague Day experience. Over a dozen players and siblings - all sportswriters - contributed. Below are excerpts and drawings from the winners, including: Abby G., Kelsi M., Jordan G., Erin M., Zach G., Akshay G., Colin M., Brayden G., Andrew C., Mitsuko K., Jake M., Liam S., and Nick G.
Interleague Day is a day where people from other teams get together and mix up the teams. When you get there you have a nervous tension, but when the game starts, BANG! Excitement flows through the air like sound waves! "Swish!" 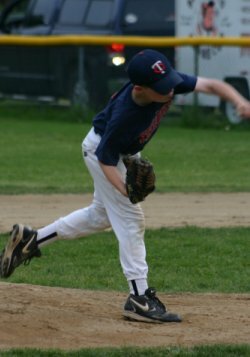 the pitcher throws the spiraling ball. "Smack!" the batter hits the swishing ball, hitting it to the outfield, sending the center fielder dashing for it desperately. Today is Interleague Day, the day that I've been waiting for. I love swinging my bat at the ball flying at me and smashing it for hits. I love hearing the crowd roar as the players are introduced and hearing the words “Play Ball!” to begin the game. I love Interleague day because I get to do what I love to do…play baseball! Another great thing about Interleague Day is the food—it's delicious!! I like Interleague Day because I get to play with other players and friends. Most important, these games raise money for the Jimmy Fund which is a very worthy cause. I loved Interleague Day because I got to help out with Chuck-a-Ball. The awesome prizes were gift cards from the Bowladrome, Sorrento's pizza, and AtBats T-shirts. It was a great day for the games and I'm proud I was there to cheer my brother on. I was there all day except for about two hours. Even though my team got crushed and I didn't win the raffle, I had loads of fun! I wish we had Inter-League All Star Day every month! I can't wait until next year. I like Interleague Day because I get to play with other players and friends. I enjoy playing and I wish we could do it many more times. I think it also helps your team because you get to see other kids play and then you know if the kid hits or pitches well. I also like how they make it like an All Star Game. These are some reasons why I like Interleague Day. I loved Interleague day because I got to help out with Chuck-a-Ball. It was great helping out with Chuck-a-Ball! Chuck-a-Ball is like Chuck-a-Puck but with a ball. I also got to help out with the music. That was fun. I loved Interleague day so much! It was the 2nd Interleague day in the world! “Swish!” the pitcher throws the spiraling ball. “Smack!” the batter hits the swishing ball, hitting it to the outfield, sending the center fielder dashing for it desperately. Today is Interleague Day, the day that I’ve been waiting for. I’ll tell you why I love this day. These are some of the things that I love about this day. I enjoy the tasty smell of hamburgers and hot dogs, and the coolness of the drinks. Another thing is the joy of batting, or being in the field, ready to catch the ball. The last thing I love about inter-league day is chuck ball. Listening to their voices shouting, “Chuck ball!” forces you to smile, and to throw your ball the closest to the bucket or the pitcher’s rubber. These are all of the things that I love. I love Interleague Day for many reasons. First, I love swinging my bat at the ball flying at me and smashing it for hits. Also I enjoy joking around with my teammates and having a great day. I love hearing the crowd roar as the players are introduced and hearing the words “Play Ball!” to begin the games. It’s music to my ears when the ball solidly connects with my bat and fielders diving with effort to try and nab the ball screaming at them. I love playing the game, but I enjoy being in the stands too. 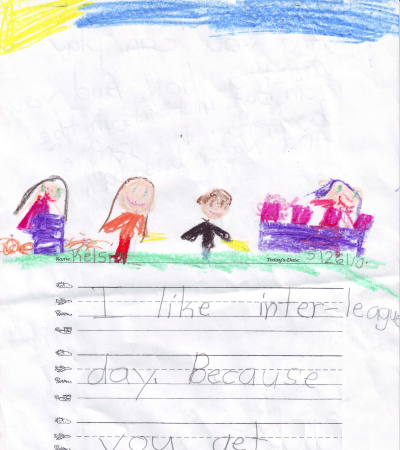 When my dad told me about the Interleague Day, I was really excited because it seemed fun. I liked the raffle a lot. I really wanted the signed balls, but I didn’t win it. I was also excited to play with players from different teams, but I was afraid I wouldn’t do well. It turned out that I got a hit every time I batted! I played good fielding, too. I had no idea I could play baseball so good. I enjoyed the Chuck-a-ball contest, too. I won a t-shirt. Here are some of the things I did at Interleague All-Star Day: I controlled the sound system for the national anthem, Chuck-A-Ball, and the music in between innings almost all day (except when I left for a party). I enjoyed the sound system because it made me feel like I was actually an All-Star and because I got to use it. I liked the songs for it that were on the iPod because they were appropriate for Interleague Day. I like Chuck-A-Ball because you get to chuck a ball and always win an awesome prize. The awesome prize was a $3 gift card and an Interleague All-Star Day sticker. You can also win a slice of pizza to Sorrento’s, an At Bats t-shirt, a Mad Skills t-shirt, a brand new baseball, and a $15 gift card to the BurgerDrome. My brother won a piece of pizza at Sorrento’s but the problem is that he does not like pizza, so I get it and my dad or mom will need to get something else for him. He probably will get fries and chicken fingers. I don’t know if he still has the gift certificate. The gift certificate is just a business card with something written on the back of it. There was Chuck-A-Ball every hour at alternating fields. It was a bigger hit than last year, I think. I liked seeing the kids chuck a ball because it looked like they were having fun and always got a prize. I did not win anything in Chuck-A-Ball but I was happy that I still won the gift card. I liked that everyone could participate in Chuck-A-Ball even if you do not play baseball. I just liked playing at Vets because I don’t play there that often and also I liked having the scoreboard. I liked seeing almost all of the kids having good sportsmanship and not teasing if they won or not. I played the first baseball game of the day which my team tied 8-8. A lot of other players had games and it looked like they all had fun. I liked just seeing kids playing baseball and them having fun. I liked that Minor B also got to play because they don’t usually play at Vets and they must have had a lot of fun. I have a friend in Minor B. He told me it was awesome! He said that he had a lot of fun. I think it was smart to have Minor B play. I bet they also had fun having the scoreboard going. 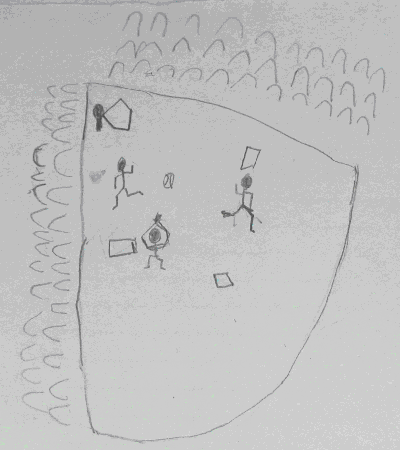 I think it would be interesting to have Minor C and T-Ball play at Vets. I liked seeing a Minor B kid say “Play ball!” into the microphone after we announced the players and listened to the national anthem. I think it was nice to let Minor B play in Inter-League All Star Day and I think they should play in it next year. I liked that the lawnmower groomed the field after each game because it was a lot faster so we got to play more ball. I liked that some people went out to fill in the dirt holes in the outfields so that the kids did not trip in the holes. I enjoyed having Slowpokes BBQ at Vets because I did not need to go home to get lunch and miss some baseball. I enjoyed the raffle table because all the money went to the Jimmy Fund and last year I won Red Sox tickets. 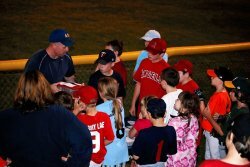 I think it was nice that if a team did not have enough players they would ask other kids if they would like to play. My brother got to play two and a half games. My dad and I were the first there and me, my dad, my brother, and my Minor B friend, Jordan, were the last ones there. I think I was there the longest. I was there all day except for about two hours. Interleague Day this year was a blast. I couldn't believe how much there was to do. With the Chuck-a-Ball after every game and being able to buy raffle ticket to support the Jimmy Fund and win amazing prizes like a Kevin Youkilis signed ball. There is nothing better than that. What I love about Interleague Day. I love knowing that all the money we spend is donated to the Jimmy Fund. I also love how we get to meet new kids and play the game we all love. We get to play with our friends from other teams that we might not ever get a chance to play with. I love how it’s always a fair game and everyone has fun. 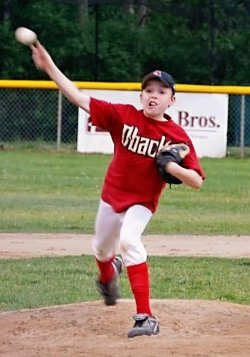 When I first heard about my All-Star game I was excited because I like playing baseball. My mom showed my team I knew some people on my team but I wanted to meet some new people that I don’t know When I got there I was happy to see my team. I wanted to see what team everybody was on. Then I got to go out to the field to warm up. Our team was the A.L. The announcer put on the national anthem. We took off our hats and held them on our hearts. The announcer called out all our names. I was first. When the game started I played second base. I got one out a grounder right to me. I threw it to first. It was the third out. We got up to bat. I was # 5 batting. The next inning I was outfield. Then I was shortstop and third base then second again. 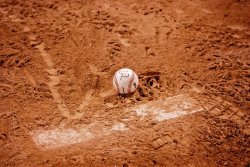 I made 2 outs: one grounder then a jumping catch!!!!!!!!!!!!!!!!! Then we had Chuck-a-Ball. Hhow to play: you throw a ball. Closest to a cone wins a prize. I did not win a prize but it was fun. I was happy. I did my All-Star game. I had never done it before.